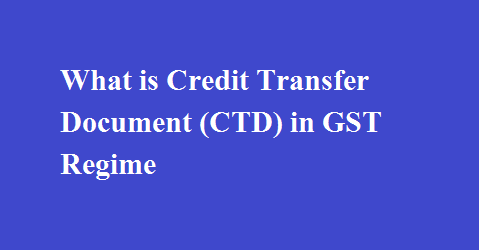 Home / GST / GST-Tally / What is Credit Transfer Document (CTD) in GST? Under GST, the duties and taxes which are paid on the closing stock held on 30th June, 2017 are allowed to be claimed as a transitional credit. If the trader is in possession of invoice or any other document which evidences tax payment, 100% of credit is allowed. Otherwise, traders will be eligible to get only part of the credit, when they actually supply the goods under GST regime. The following are the percentages of transitional credit in the absence of invoice or duty paying document. An excise dealer who has purchased excisable goods, directly from the manufacturer / 1st stage dealer / 2nd stage dealer, having Rule 11 invoice will be eligible to get 100% credit of the excise paid on closing stock. On the other hand, a VAT dealer, who has purchased excisable goods, but from wholesalers, will have a tax invoice containing only the VAT component. The excise duty paid will not be shown separately, instead, it will be passed on as part of the cost. In this case, the dealer will not be eligible for 100% credit, but instead will get only partial credit as discussed. This will have a huge impact on the traders who are engaged in selling high value products such as cars, televisions and so. Thus as a makeshift arrangement, the concept of “Credit Transfer Document” (CTD) was introduced.